The Short Banded Sailor is one of several black-and-white striped (upperside of the wings) butterfly species in Singapore. Amongst the species that have a weaker gliding flight, the Short Banded Sailor can sometimes be confused with the two Neptis spp., the Common Sailor and the Grey Sailor. The Grey Sailor has grey undersides whereas the Common and Short Banded Sailors have orange-brown undersides. The postdiscal triangular patch in the Short Banded Sailor is rounded and not as angular and long as the triangular patch in the Common Sailor. The Short Banded Sailor is common and is quite widespread in its distribution. It occurs from urban areas to nature reserves. One of its caterpillar host plants is the roadside tree, Angsana (Pterocarpus indicus), whilst in mangrove areas, its preferred host plant is the Sea Hibiscus (Hibiscus tiliaceus. 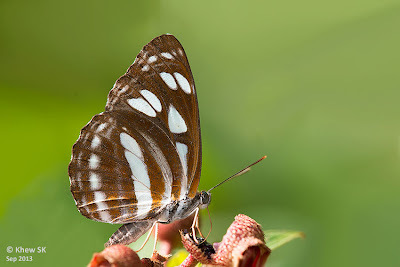 This individual, photographed yesterday, was feeding on the ripened fruit of the Singapore Rhododendron (Melastoma malabathricum) in the nature reserves.